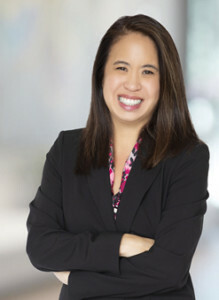 Dr. Diane Pang is a partner in the Newport Beach Office of One LLP. She is an accomplished lawyer with extensive experience in developing and managing patent portfolios, due diligence, licensing, and litigation. Diane’s doctorate degree in pharmaceutical chemistry helps her counsel pharmaceutical and biotechnology clients in both the acquisition and enforcement of their patents. While her experience is with a wide range of technologies, Diane has specific experience with many clients in the pharmaceutical, chemical, biotechnology, and medical device sectors. Exemplary fields include antibiotics, antifungals, aneurysm treatment devices, biosimilars, cell-based immunotherapy, disc herniation repair, DNA microarrays, expression systems for manufacture of biologics, hypnotic compositions for treatment of sleep disorders, ischemic stroke therapy, non-invasive cooling, nanotechnology, recombinant blood clotting factors, and teeth-whitening products. Prior to joining One LLP, Diane was Counsel at O’Melveny & Myers LLP, and an associate at Lyon & Lyon. Before law school, Diane attended graduate school in the Pharmaceutical Chemistry Department at the University of California, San Francisco, where she used mass spectrometry and NMR to study iron uptake in M. tuberculosis. She has co-authored numerous scientific publications, which appear in numerous journals, including the Journal of Bacteriology, Infection and Immunity, and the Proceedings of the National Academy of Sciences.